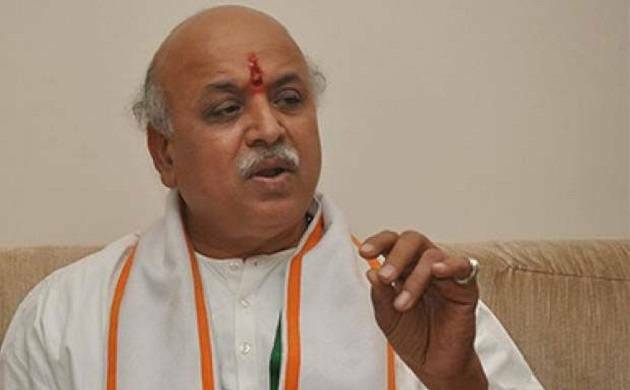 The Vishwa Hindu Parishad (VHP) on Monday claimed its international working president Pravin Togadia was "missing" since morning and held a protest demanding that he be "traced". The VHP claimed Togadia (62) was detained by the Rajasthan Police in connection with a case, but the latter denied this. Local Sola police station officials said a team of Rajasthan Police visited them today to execute an arrest warrant against the Hindutva leader under section 188 (disobedience to order duly promulgated by public servant) of the IPC in an old case, but could not find him at his residence. VHP workers laid a siege to the Sola police station, shouted slogans, and blocked traffic on main Sarkehj- Gandhinagar highway demanding that the police immediately locate him. "Our International Working President Pravin Togadia is missing since 10 am today. The responsibility of his whereabouts and security lies with the administration," the VHP's Gujarat unit general secretary Ranchod Bharwad told reporters. He said it was not yet confirmed weather Togadia was arrested or not. BJP spokesperson Jay Shah, however, claimed that Togadia was detained by the Rajasthan Police in an old case. "Our leader Pravin Togadia has been detained in an old case and was taken away by the Rajasthan Police from the VHP state headquarters in Paldi area of the city," he claimed. However, the Rajasthan Police denied detention or arrest of Togadia. "Togadia was not at all arrested by our team. As per my information, the police team of Gangapur (in Rajasthan) is returning without executing the arrest warrant, as he (Togadia) was not found in Ahmedabad. It is a rumour that Togadia is in our custody which is not true at all," said Inspector General of Police, Bharatpur range, Alok Kumar Vashishtha. Gangapur town is in Sawai Madhopur district of Rajasthan and falls under the jurisdiction of Bharatpur range of the state police. Sola police officials said the Rajasthan police had sought their help in executing the arrest warrant against Togadia. "Rajasthan police today sought our help to execute the warrant against Pravin Togadia, as his residence falls in our area. The warrant, related to section 188 of the IPC, was issued by a sessions court in Gangapur. We took the Rajasthan Police to Togadia's residence but he was not found there," said Sola police station inspector J S Patel. He said the team of the Rajasthan Police left after they could not find Togadia. "It is not true that he is in our custody. We do not know his whereabouts," the inspector added. At around 4 PM, a group of 40 workers of the VHP laid a siege to Sola police station and shouted slogans for the "release" their working president. Later, another group of VHP workers blocked the busy Sarkhej-Gandhinagar highway, but police broke up the protest.